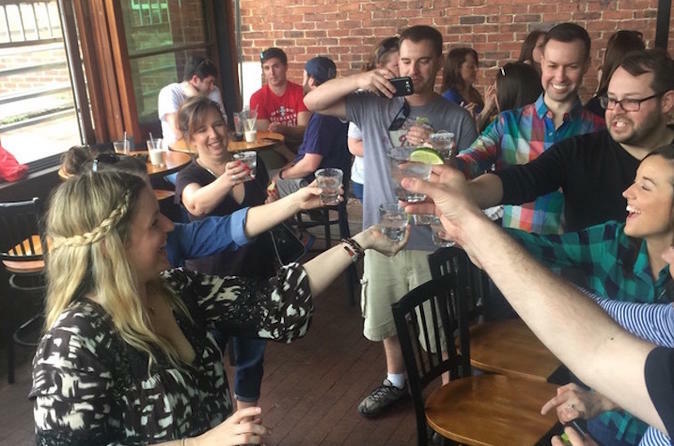 Join a shared small-group tour that features 3 local distilleries, each with behind the scenes access and tastings, some sightseeing along the way, and a chance to meet a local distiller, and to see the production and aging process, too! Experience some of Nashville's traditional and inventive local spirits including locally crafted bourbon, Tennessee whiskey, corn whiskey, traditional sorghum spirits, organic gin, and more! Tour is limited to a maximum of 12 people for more personalized attention and includes transportation to/from the distilleries, local guide and at least a dozen total tastings - three to 6 included at each distillery. This is the tour for those who want to see, hear, feel, and taste Nashville’s amazing distillery culture. Meet your guide at the designated meeting point at 9:30am and then you'll drive to 3 different distilleries. Travel with your fun, professional guide who also happens to own their own bourbon brand. You’ll get behind-the-scenes tours at each distillery, have the chance to meet and talk with a distillery owner, learning about the history, production, and characteristics of some of the best whiskey in the country. Sample cocktails that highlight the unique flavors of a variety of locally-made spirits and taste no fewer than 16 locally-distilled varieties along the way, including a range of Bourbons, Tennessee Whiskey, and unusual artisan and historic spirits made from a wide range of grains and ingredients. Finish up with a specially arranged rooftop tasting flight of regional bourbons served at a local restaurant where you can linger over a lunch (at own expense), if you like. You’ll be treated to interesting stories and sights along the way as we travel to each of the distilleries in a comfortable vehicle, passing by landmarks that make up Nashville’s inspiring history, and even enjoying a chaser on the ride between distilleries, if you’d like to bring one along. All tours and samplings are included in the price, and your tour is limited to no more than 12 fellow spirit-lovers. Tour will end around 1:30pm at the original departure point.